Tristan Durie is an accomplished flautist who is extremely active as an orchestral, chamber and solo performer. Recently, he has performed with groups including the Canadian Opera Company, Hamilton Philharmonic Orchestra, New Music Concerts, Esprit Orchestra, the Kingston Symphony, the London Symphonia and the Ontario Philharmonic. Tristan is particularly sought after in Toronto’s new music scene where recent notable projects include a fully bicycle powered, 21 concert tour of Ontario with “The Bicycle Opera Project”, Faun Opera’s production of Adam Scime’s “L’homme et le ciel” as well asa the Toronto premiere of Brian Harman’s “Surface” for solo flute. 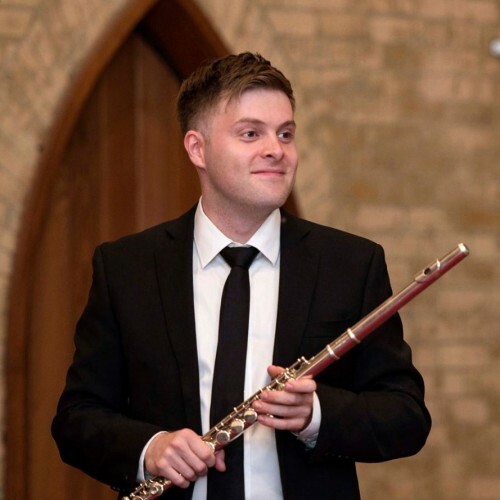 As a member of “Charm of Finches” Canada’s premiere flute quintet, he has helped commission and premiere numerous new works by emerging Canadian composers. During summer masterclass programs at Domaine Forget, the Orford Arts Centre, the Lunenberg Academy and the Banff Arts Centre, he has studied with many world renowned flautists including, Emmanuel Pahud, James Galway, Mathieu Dufour, Robert Aitken, Lorna McGhee, Philippe Bernold and Robert Langevin. Throughout his studies Tristan has been the extremely grateful recipient of the Arthur Plettner Graduate Fellowship, James Craig Opera Orchestra Award, the Percy Faith Award, David and Marcia Beach Summer Study Award, the Jean A. Chalmers Award as well as a CBC Radio Canada Galaxy award. He holds a Bachelor and Masters of Music Performance with a minor in Composition from the University of Toronto where he studied flute with Prof. Leslie Newman and Prof. Douglas Stewart and composition with Prof. Norbert Palej. He is currently completing his Doctor of Musical Arts in Flute Performance at the University of Toronto.